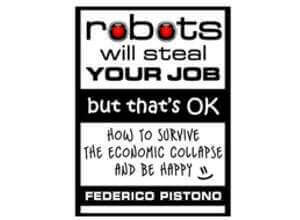 Meet The Author Of "Robots Will Steal Your Job, But That's OK"
Federico Pistono knows automation threatens jobs. To deal with it, he thinks we need to change our economic philosophies. Growth is a good thing, right? It’s the buzzword on seemingly every politician’s lips, the answer to our economic woes. You know this if you watched President Obama’s latest State of the Union Address. Increase the production of goods and services and stimulate consumer spending, that’s how we get this downtrodden economy back on its feet. Makes sense to me. To Federico Pistono, however, it does not. The 26-year-old, self-described computer scientist, author and social activist is currently working on a book with which he plans to poke gaping holes in the conventional wisdom of ‘growth is good.’ The book, titled “Robots will steal your job, but that’s OK – How to survive the economic collapse and be happy,” is part of a crowdfunding campaign and has received a lot of support. Multiple publishers have approached Pistono about the book, but when it’s finished he intends to distribute it freely to the public. The Verona, Italy native questions those who pin the current recession on bad economic choices by CEOs and politicians and asks us to rethink what a healthy economy should – and could – look like. Yes, bad, damaging choices have been made. But human greed and short-sightedness, Pistono thinks, is secondary to limitations that are inherent to the global economy. He thinks that technological developments have finally driven us towards a choke point that will be reached within the next fifty years. Automation is taking jobs away faster than economic growth can replace them, and it’s only going to get worse. I recently spoke with Pistono about his book, robots, our economic future, and what it means to be happy. How is our economy today different from the economy 100 years ago? At the beginning of the 20th century we lived in an agrarian society that employed 98 percent of people. As technology progresses and old jobs are eliminated you kind of move through cycles of job elimination and job formation. At some point you run out of cycles where there are no more jobs to fill except for a very few highly specialized jobs, the kind of jobs that require many years of education. Now, it requires more time to be educated into these new sectors than it requires for the technological progress to advance. The thing is, we used to be able to keep up with the speed of technological progress because we were at the beginning of the exponential curve. At the beginning the doublings didn’t seem unsettling for the global economy because we could keep up with it. It’s within our mental capabilities to keep up with it. After some time when you reach a point in the curve when it becomes to fast. I don’t think education can be solved by governments or institutions of any sort because institutions by definition are institutionalized. They can’t make progress. But if you look at the Khan Academy, Udacity, open courseware, things like that can enable new generations to speed up the process of education and learn to be a biotechnologist, for example, in two years or three years for free at home. So right now, if you don’t have a higher education already, it’s already too late? I’m wondering about the millions of people who haven’t learned the most important thing: critical thinking and problem solving. They might have learned skills such as driving a truck or carpentry but they don’t know how to solve problems. In this type of economy I don’t know how you can educate these people to do these highly sophisticated, very challenging jobs that the new economy will require in five to ten years time. I just don’t see how a 50-year-old truck driver can reinvent himself in five to ten years. What are the consequences of massive amounts of unemployed people around the world? I think this whole thing is going eventually to collapse into an unsustainable social situation where you have riots. I mean, when people don’t have food, basic necessities and they don’t see a future for themselves or for their families they’re going to start to get really pissed off. They’re going to grab guns. I would like to avoid that. The solution is to prepare for a change in the economic system. If we resist automation we are still going to see this problem. Companies need to be productive and in order to be productive you have to automate, that’s the only way to increase productivity. It’s been true for 200 years. The only way I can see out of this within this economic system is for the state to take over and just employ people for doing nothing or almost nothing. But states and governments are already broke, so I don’t see how that’s possible. Another way would be to just socialize. Many people have proposed a minimum wage just for living. So if you’re a citizen you get a thousand dollars a month. In Martin Ford’s book “The Lights In The Tunnel” he comes with very, very convoluted arguments like we’re going to pay people to read books because we want people to be smart and stay informed. I read that and I think, yeah, it makes sense within this type of culture, but I think it’s fundamentally corrupt and quite plainly insane. I think the only way out is to rethink the labor for income and income for survival cycle. And I think that the argument that it’s going to be either capitalism or socialism, I think those are 18th century ideas that are obsolete in world of interconnected, global information and economies where everything is instant and can be transferred. We have enabling technologies like 3D printing that makes the old way of thinking of manufacturing obsolete. One must start to wonder if this growth paradigm is even possible, in the physical sense. So I made some calculations that were confirmed by Tom Murphy, a physics professor who writes the blog “Do The Math,” where he proves mathematically and physically that continuous growth on this finite planet, even with all the efficiency mechanisms of the market system is physically impossible. Plain and simple thermodynamics, it’s impossible to grow at the current rate for more than fifty or sixty years. So on one side you have the physical impossibility of growth, on the other you say, wait a minute, even if growth was possible did we ever even stop and think if it was desirable? For hundreds of years there was a correlation of growth and quality of life, because you needed to go from having nothing to having a good standard of living. And once you’ve reached a certain point where you have enough to live by this correlation no longer holds. This is because it wasn’t a causation it was just a correlation. One did not directly cause the other. Once some enabling factors come in you have this decoupling of growth and happiness and quality of life. In fact research shows that it is inversely correlated when you increase by a large factor the wealth that a person has. If you make eighty or a hundred thousand dollars a year that’s enough for you to live by without having to worry about money. But if you make millions and millions you accumulate more stress. The monetary inequalities within a state is a very good indicator of that state’s social health. The more unequal the country is the worse the situation is. You have high crime rates, suicide rates, depression, everything. How can I be happy without a capitalist economy? It’s atrocious to think that the highest peak of a person would be to barely survive in an economy where we can create an abundance for basically everyone on the planet. I think it’s not only myopic, it’s morally corrupt and intellectually corrupt. It’s not just a technological problem, it’s a sociological problem, an ecological problem because it’s physically unsustainable, and an economic problem. I know it’s hard because many people have been educated into believing in this kind of system and don’t think any other is possible. We first have to move away from thinking that growth will solve our problems. That’s not true, we’ve known that for forty years, but we have deluded ourselves into believing that. I think the countries should recognize that an indicator of the wealth of a nation is not the GDP, but maybe some other indicators that have been developed like the GNH, which is Gross National Happiness or the quality-of-life index. Those are the things we should be maximizing. I agree it’s a harder thing to quantify than profit, but to think that with our current AI algorithms, computational power, and data that it would be too difficult to estimate the quality of life of a nation, I think it’s highly irrational.